﻿World Kidney Day: Calendar, History, Tweets, Facts, Quotes & Activities. World Kidney Day seeks to raise awareness of the importance of kidneys to overall human health and inform the world about ways to prevent kidney disease. Kidneys remove waste products and excess fluids from the body while releasing various hormones and producing vitamins. Humans have two kidneys, located on either side of the spine in the lower abdomen. 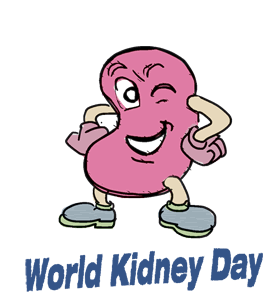 World Kidney Day is part of the World Health Organization's health-related celebrations. It was first celebrated in 2006. It is observed on the second Thursday in March each year. "Kidney Health for Everyone Everywhere" is the 2019 theme for World Kidney Day. The aim is to achieve universal health coverage (UHC) for the prevention and early treatment of kidney disease. UHC is a policy under which people from all socioeconomic groups can receive top essential healthcare. The theme for World Kidney Day in 2018 is "Include, Value, Empower". The leading cause of Chronic Kidney Disease is diabetes. Diabetes results in high blood sugar levels, which causes organ damage and affects the kidneys abilities to filter waste. Drink plenty of water - 6 to 8 cups daily. Stop smoking. Smoking reduces the flow of blood to the kidneys, which in turn causes them to operate inefficiently. Smoking also increases the risk of developing kidney cancer by 50%. Limit your consumption of over-the-counter pills such as Ibuprofen which can cause damage to your kidneys. Get your kidney function checked if you are in a 'high risk' category.